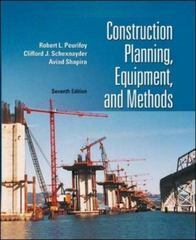 Construction Planning, Equipment, and Methods 8 Edition The Eighth Edition of Construction Planning, Equipment and Methods follows in the footsteps of the previous editions by providing the reader with the fundamentals of machine utilization and production estimating in a logical, simple and concise format.This text is aimed at supporting a basic undergraduate construction equipment course that is part of an engineering curriculum. It is also applicable to graduate equipment courses. In addition, since technology is constantly evolving, this text provides an understanding of machine capabilities and how to properly apply those capabilities to construction challenges.